Students in the short-term, have made a long-term difference here at UW-Milwaukee. Whether it be an internship, class project, student organization initiative, or research, students have had a lasting impact on the UWM campus. 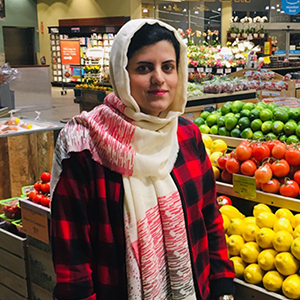 As a graduate student in Urban Studies, Hamideh researched and assessed food procurement practice and policy on campus through the Real Food Challenge. She applied her expertise and organizational skills to analyze the yearly UWM food purchases data and provided us related information, evaluation, and effective recommendations regarding programmatic and policy changes to drive UWM to 20% Real Food. Having her as an intern in the Office Sustainability, helped us tremendously to complete the RFC project for the 2017-2018 academic year. Her fantastic work also contributed significantly on our STARS project and how we frame local food decisions at higher-education institutions in WI. “Hooping for Hoop Houses” became Laura’s trademark. Her energy and drive in the campus gardens led Laura to devise a plan for on-campus composting. While working in the Office of Sustainability, Laura went outside UWM to receive a Food Leadership Certificate from the Victory Garden Initiative of Milwaukee. 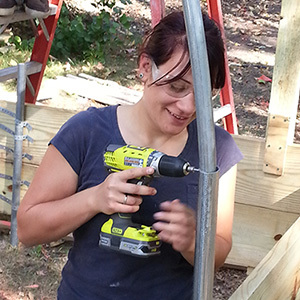 She applied that knowledge to garnering a hoop house for UWM to do its own composting in. Through her hula hoop marathon fundraisers, “Hooping for Hoop Houses”, Laura helped secure the funding and strategy for building the hoop house that is currently in operation. With an eye for the composting business, Renee, a Conservation and Environmental Science student, brought her expertise to UWM’s hoop house composting operation. With a strong sense of how professional kitchens operate, along with a propensity for lab work, Renee was able to bring UWM’s on-site composting operation into full production. Systems were put in place for campus food hauling. Handled as a science experiment, different methodologies were tested and results were verified in the lab. 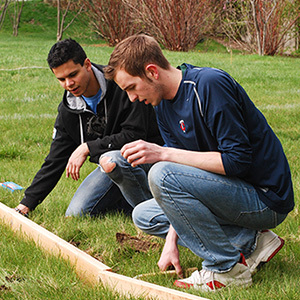 When the campus gardens were set to expand, a design that meant more than just garden beds was needed. The space, east of Sandburg Hall, presented multiple challenges of access, slope, and water availability. First, through the efforts of the student organization, Emerging Green Builders, Pete organized students to participate in a student charrette . The original design for kitchen and community gardens was born from this. But to meet the on-site challenges and opportunities for stormwater, Pete, an Architecture student, was joined by Milam in Engineering and Danielle, a double major in Conservation and Environmental Science and Architecture. This interdisciplinary team worked to draft, design, fund, and assist in its full development. A series of rain gardens on site run into an underground cistern. This water is now used for watering this campus garden. 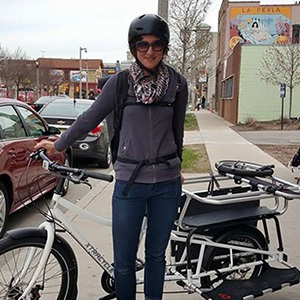 Without the efforts of Peter, a graduate student in geography, UWM would not have the student-supported Bublr Bikeshare on campus. First, through his research on the relationship between a city and a university, and their interdependence on a bike-friendly community, Peter raised the profile of making this more intentional at UWM. Also, as a senator of Student Association, Peter led several in depth discussions about the impacts of transportation on the system, rather than just on the individual. Peter, along with the support of several other Senators, put forward a funding strategy for a five-year plan with Bublr out of the reserve funds. 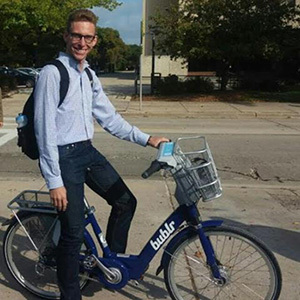 As an intern in the Office of Sustainability, Peter was able to leverage his research and pivotal role in Student Association to work with Facilities, Campus Planning, Transportation Services, and Purchasing to see six UWM Bublr stations installed in the fall of 2015. Jing Hong, a PhD student in Architecture, is studying the performance of green roofs for both storm water management and reduction of the heat island effect in cities. 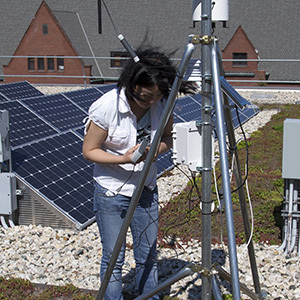 She will use data gathered from sensors on the roof to test a computer simulation model of green roof moisture and heat flow. The computer model will be used to predict optimal green roof design for any climate. This research is sponsored in part by a grant from the Milwaukee Metropolitan Sewerage District. 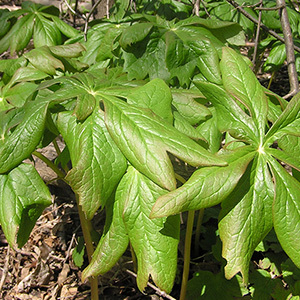 After examining “leaner, greener” campus projects through a geography course, Lia took on promoting campus and community use of the Downer Woods area as an internship. Over the course of the spring semester in 2011, Lia researched funding opportunities, the physical and psychological benefits of urban green space on urban residents, the history of national parks and green spaces and planned several events that could be held on campus to get students involved with Downer Woods. 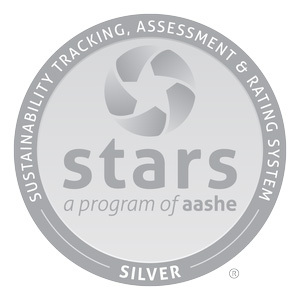 Over the years, several graduate students in Urban Planning have been a part UWM’s reporting through STARS, Sustainability Tracking, Assessment & Rating System. Students have prepared transportation surveys, evaluated UWM’s food sales through the Real Food Challenge, evaluated campus tree care, and developed an interactive sustainability symposium to relate what STARS is and could be to the UWM campus.